Paper bags for flat bottom products up toNowadays they are in great demand all over the world, especially in the USA and Western Europe. Such packages were invented and patented by Luther Crowell as far back as 1870. The packages were originally monophonic, beige-brown in color, later they were printed on drawings and advertisements. Even later, the pouches appeared on the bags, but they did not change the shape. In 1957 more durable and inexpensive plastic bags came out on the market, pushing the paper bags. And in a few decades the global ecological problem with polyethylene wastes became obvious. This little digression into the history of the paper package smoothly brings us to today's hand-crafting with our own hands - a sort of linen alternative to the package - a bag of jeans with your own hands! In fact, a bag of this type can easily be worn in everyday life by attaching pens. But the authors of the project initially considered it as a substitute for a paper or plastic bag in shopping trips. So, in order to get a bag of jeansWith their own hands, we will need: unnecessary jeans, belt, thread, needle or sewing machine. 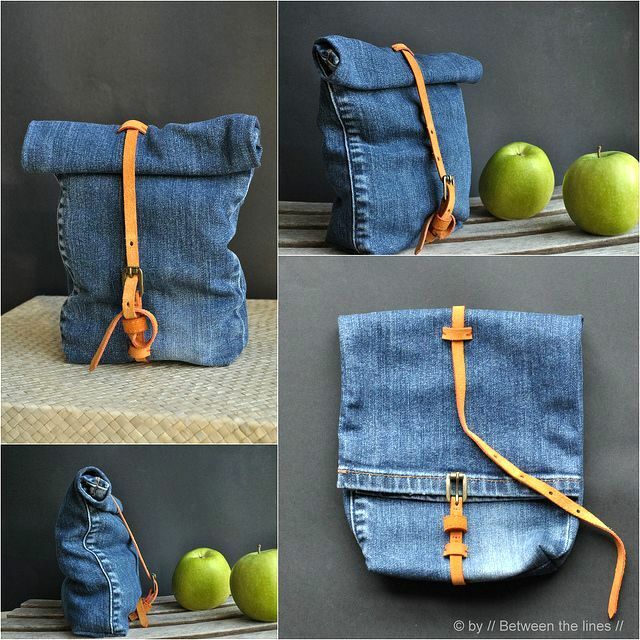 It is worth noting that the size of the finished bag depends on the original data, that is, from a pair of jeans. It is not recommended to use children's or tight jeans, unless you want to get a handbag for cosmetics or a case for office tools as a result. The main stages of the work are presented in the photo below. Lay out the trousers and estimate the size of the futureBags in a folded base form. To do this, bend the bottom edge of the leg (the top of the bag) to the desired length, mark where the bottom of the bag will be, and then boldly cut the leg (photo 2). Take the strap, attach the buckle to the "entrance" of the bag in the folded base view and near the "bottom" cut the rest of the belt (photo 3, 9). Let the size of the part with the buckle be at least 10 cm. Sew the strap to the front of the bag, close to the bottom edge (bottom). Now turn the pant leg inside out (photo 4). Sew by hand or on the sewing machine bottom on the edge (photo 5), and then stitch the corners as in photo 6. With this stitch, you adjust the width of the bottom of the bag. In advance, estimate this parameter. If this corner line is not made - the bag will be flat. It remains to sew a "tail" strap. Remember that a bag of jeans with your own hands can become higher if necessary, but the strap should be able to be fastened. Unfold the top of the bag to the maximum length, attach the strap to the middle of the back of the bag and note the length. Cut off excess, if there is. If necessary, finish the holes in the strap (photo 7). Sew the strap (photo 8). This option does not involve handles, as it was conceived as a bag-package. 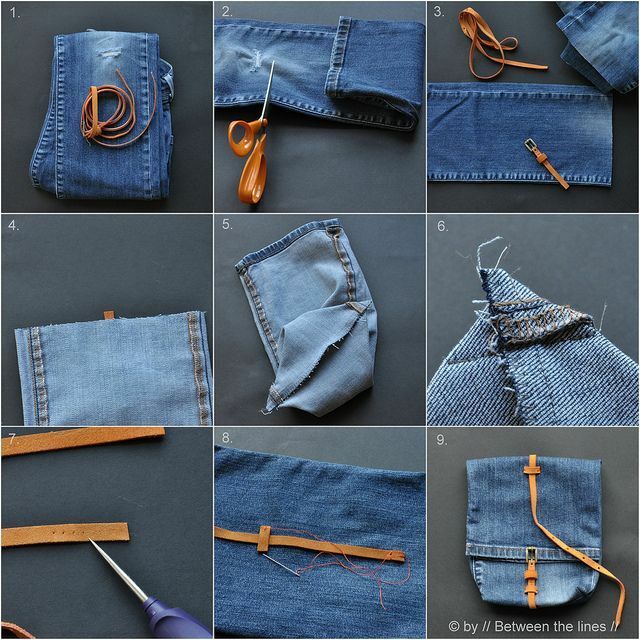 But absolutely nothing prevents you from sewing one long handle over your shoulder, and you can make it from jeans, and from one more strap. Also a backpack variant is possible. The space for creativity and refinement is unlimited! 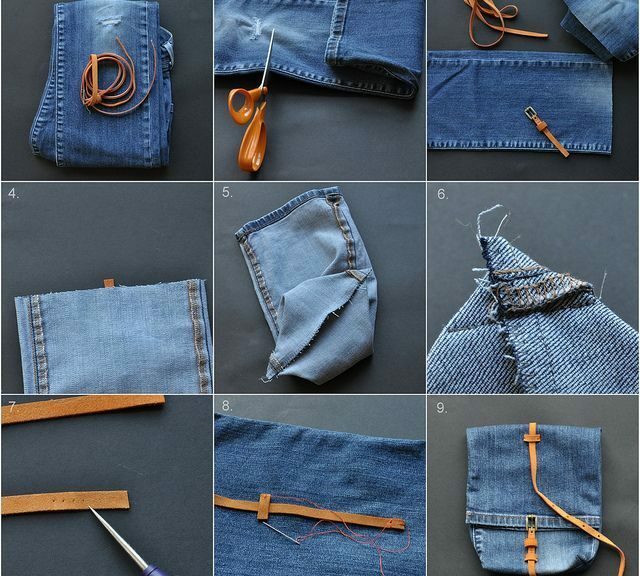 And most importantly, to make a bag of jeans with their own hands is very simple and fast.